In response to rising rents and house prices, millions of people around the world are today turning to alternative housing options such as tiny houses and vans. Raised on the internet and unable to afford housing, the millennial generation are giving the proverbial finger to the housing market and sharing their #vanlife lifestyles and #tinyhouse builds on social media. Tiny houses are typically under 50 meters squared and range from $10,000 to $50,000 to construct. They have everything you’d expect in an average house, though on a smaller footprint. There are some amazing Youtube channels out there which showcase the unique innovations and emerging styles. While I love the movement, tiny houses are ultimately limited by where to park them. They’re built on large trailer bases but are intended to be parked for long periods of time to be connected to utilities such as electricity, water and (sometimes) sewage. As such they are usually parked in the backyard of a friends’ or parents’ house, and often still require paying rent to a land owner. Van living or vandwelling has the flexibility of instantly moving to any new location and the advantage of paying zero rent. During the day, vandwellers are either at their office job, in a coworking space or exploring the world. And at night most people simply stealth park on quiet streets, in parking lots, near public parks or rest areas. In many countries it is perfectly legal to sleep in your vehicle; in Australia it is legal in all states except Queensland. As you can see the exterior is a stealth Mercedes Sprinter panel van, while the interior style is modern, inviting and tall enough to stand up inside. Eamon and Bec have a sink with running water, a bar fridge, stove top, blender, couch, and full-sized bed; not quite a complete campervan but still comfortable. Some vandwellers even choose to add a shower and toilet. Where do they poop? Public toilets, office, work, gym. Where do they shower? Gym, public showers. Where do they do laundry? Laundromats. Where do they park? Side streets, parks, churches, green spaces. How do they park in the city? Stealth vans, covering windows. What do they eat? Food, mostly vegan. How do they make money? Job, freelancing, business. Rent is free, only the cost of fuel to consider. Very low total living costs: under $12,000 per year. No crazy housemates to deal with. Your home is your transport. Freedom to instantly move anywhere, even to new cities. Low environmental footprint, low consumerism. #VanLife as it stands today is a very compelling housing alternative to the adventurous and counterculture demographic. Though to dramatically reduce demand for fixed housing, the van life must become 10 times better than living in a shared room, shared housing or small apartment unit. We live in an era of exponential technological progress with new breakthroughs and advances competing for our attention everyday. Our brains evolved to cope with a linear reality where very little changed from year to year. But in today’s hyper-connected global society, we see a law of accelerating change where exponential “doublings” occur every 12 months. Underpinning it all is the exponential price-performance of integrated circuits, which has held true since the 1960s. 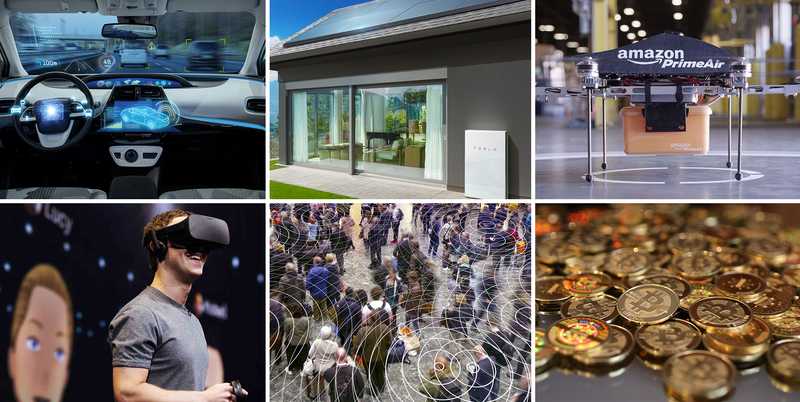 Today we’re seeing rapid advances in AI, robotics, autonomous vehicles, solar energy, battery storage, drone delivery, mixed reality, internet of things and blockchain. The convergence of these technologies could enable driverless van homes to become the superior alternative to apartments and shared housing. Today at least 44 companies are working towards building fully autonomous vehicles that can safely drive in all conditions better than any human driver. Autonomous vehicle initiatives by Tesla, Uber and Google’s Waymo are already showing amazing progress on public roads. Waymo’s fleet of driverless minivans have driven over 4 million miles on public roads and 2.5 billion simulated miles, with safety records superior to any human driver. In November 2017, Waymo was the first to claim Level 4 autonomy on an autonomous rating scale that peaks at Level 5. For practical reasons, autonomous vehicles are all-electric; you wouldn’t power a robot on diesel fuel. Thus with no need for a driver or combustion engine, it’s best to think of these vehicles as simply rooms on wheels. This opens the possibility for modular autos, minibus autos and minivan autos. Imagine if your home could pick you up and drive you anywhere. Solar, without any subsidies, is now the cheapest energy you can buy in the sunniest parts of the world. As Ramez Naam points out, in 1977 to buy 1W of solar panel it cost about USD$77. Now it costs USD$0.30 and the price is continuing to drop at an exponential rate. Every hour, more solar energy hits the Earth than humanity consumes in an entire year. The combination of cheap solar power and dense battery storage can enable 100% off-grid energy needs wherever you go. In fact, the new all-electric Tesla Roadster due out in 2019–2020 will have a 200kWh battery pack with a range of over 1000km (620mi) on a single charge. Imagine if your home powered itself and your devices with free electricity. Electric drones and quadrocopters are now a cheap commercial reality mostly used for fun, racing competitions or to film aerial shots. However the clear use-case is autonomous drone deliveries to solve the costly last mile problem. In fact Amazon is aggressively pursuing a drone delivery service right now. A partnership between Matternet and Mercedes-Benz is pairing autonomous delivery vans with autonomous drones on the roof of the van. As solar and battery technology improves, it opens the potential for autonomous heavy-lift drones that can fly vast distances and provide ondemand everything. Imagine if drones delivered food, parcels and did your laundry ondemand. Oculus, VIVE, HoloLens and Meta are among dozens of companies pushing forward the hardware requirements for VR, AR and MR. And on the software front, developers are able to build on these devices today using Unity VR, Apple’s ARKit, Google’s ARCore, Daydream and Windows Mixed Reality. As these hardware devices miniaturize and rapidly drop in price, it’s only a matter of time before they’re as ubiquitous as smartphones today. The ability to have complete personalization of your experienced reality and freedom to move yourself anywhere across spacetime is truly amazing. Imagine if you could sit in a small room, but be in a vast virtual landscape. 5G is the next coming generation of high-speed wireless broadband offering speeds of typically 1Gbps to 20Gbps. Although some tests have already achieved 200Gbps speeds and 2ms latency. If you know what any of that means, those speeds are absolutely ludicrous even in comparison to fiber. The Internet of Things or Internet of Everything, refers to every object having embedded electronics and wifi chips which connect it to the internet to report sensor data or autonomously trigger actions and interactions with other objects. 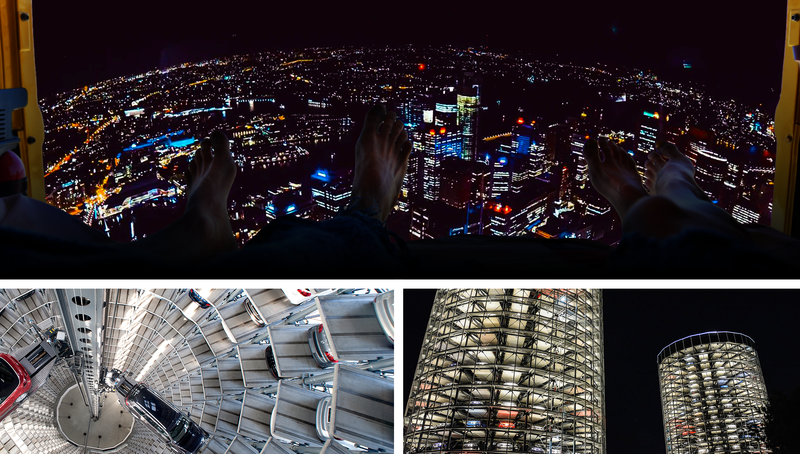 By 2030 there will be more than 125 billion IoT devices; your shoes, toaster, car and everything we have a word for will be connected. Imagine if your wifi was available everywhere you went; always up and fast. The freelance or gig economy is a huge trend that will continue to rise as automation eats away full-time work. By 2020 about 43% of the US workforce will be freelancers moving between employers on a project-by-project basis. The traditional 9-to-5 job is coming to an end as the pace of technological change demands a more fluid workforce, and opens the global talent pool. Uber, UpWork, Deliveroo and TaskRabbit are early attempts at gig economy platforms, however they all spectacularly fail at providing a suitable or sustainable economic model for gig workers. This doesn’t mean gig-based work will always be exploitative. My own blockchain-based project, Peerism, is aiming to solve the problem in a novel, equitable and empowering way. Blockchain technology, which underpins Bitcoin and Ethereum, is currently in the process of revolutionizing and decentralizing our global society to give power back to the people. The combination of tokenization, cryptoeconomics and cryptocurrency will enable harmonious global P2P communities to share products, services, wealth, tasks, knowledge and skills; with no middleman. Imagine if the economy knew your interests and sent you high-paying work. The moment Level 5 autonomous vehicles become a reality, then Level 5 autonomous van homes become a reality. The problem of fully autonomous vehicles is not an easy one to solve, but with every major manufacturer tackling the problem, most predictions suggest within 2 to 5 years. The van finds where to safely park overnight. The van finds where to park during the day. The van can drive you anywhere ondemand. The van can pick you up from anywhere ondemand. The van can drive you to the nearest amenities. The van recharges itself on near-free renewable energy. In the future the normies will clock-off from work to begin their 45 minute commute to their expensive room in a shared unit on the outskirts of the city. Meanwhile you’ll step out of the office and seconds later your van will roll in to pick you up; you’re immediately home. Zero train tickets, zero rent cost. In the future the normies will finish a big night out on the town and pay an autonomous Uber to drive them 20 minutes home because public train services stopped at 2am. Meanwhile you’ll step out of the pub and seconds later your van home rolls in so you can jump straight into bed. In the future you’ll be able to voice any ondemand request to your van, and minutes later a drone will land on the roof to fulfill your needs. If a drone can deliver you super cheap and healthy food ondemand; then no need for a kitchen or cooking. If a drone can pickup your laundry and one hour later return with clean, folded clothes; then no need to visit the laundromat. In the future VR, AR and MR devices will be minituarized, inexpensive and connected to the internet via super high-speed 5G. Sitting in your van home at night won’t seem so claustrophobic when your VR headset can transport you into a vast open virtual world of your own making. Nor will it be lonely as platforms like Facebook’s VR Spaces continue to improve. As more people adopt the driverless van home lifestyle, demand will grow for dedicated overnight parking and facilities. The vans could drive themselves to modern community caravan parks on the outskirts of the city which would offer basic amenities for a small overnight fee. If demand grows further, it may become economical for developers to construct vast parking tower complexes within the inner-city zones. For a small overnight fee, these towers could offer a place to safely park and recharge your van. Though why stop there: imagine if these towers included restaurants, cafes, bars, supermarkets, retail stores, laundromats, shared kitchens, communal areas, entertainment and more. The average rent for a single room in a 3 bedroom shared apartment in inner-west Sydney is AUD$250 per week. If you outright own your all-electric driverless van home then the only running cost is electricity and the rare occasional maintenance. With the costs of solar power dropping at an exponential rate, electricity could become very close to free. If your rent suddenly dropped to $0 tomorrow, what are the minimum living costs you would need to cover? Electricity, food, clothing, internet, phone? With drone delivery and 5G internet it should be possible to reduce your total weekly living costs to well below $300 per week; perhaps even $50 per week. Buying a driverless van outright is going to be expensive. If autonomous Uber vehicles are everywhere in the future, it won’t make economic sense to own a car. Neither will it make economic sense to own your van home. Instead you will rent your driverless van home and only pay for when you use it. And if you’re not using your van during the day, why not safely lock away your belongings and put it to work autonomously delivering parcels or moving passengers around? Tesla has already announced plans to offer such a service. Interestingly the van can own itself by managing its own income and maintenance expenses via a wallet address and smart contracts on a blockchain. Unlike houses, vans already depreciate in value. With van homes owned by the blockchain commons, they can never be exploited for personal profit gains and will thus tend toward charging rent at zero profit. The rate of technological change today is scarily immense, with each day bringing new uncertainties and anxieties to plague billions of people on this planet. Our current political and economic systems around the world are failing to adapt fast enough to nurture and empower all of us to flourish in harmony with a finite and natural ecosystem. 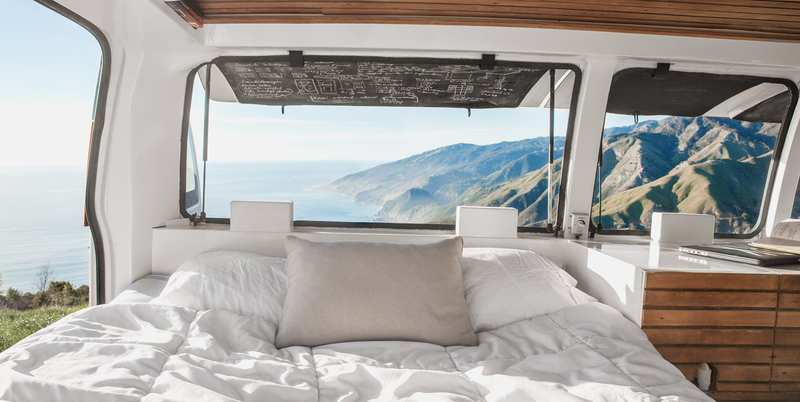 Van homes have the potential to free people from the drudgery of jobs and unshackle them from the clutches of the rentier class of landlords. Imagine hundreds of millions of people free to explore their interests and passions without the crippling stresses of earning an income simply to stay alive. The #vanlife hashtag is a hint of the beautiful, vibrant and supportive community that can continue to grow to reach millions more. No human should struggle to survive. Human needs are human rights. Let’s work together with the cards we have to make a better world for everyone. Driverless van homes. The meme must flow.